Ella Rhodes reports from a first annual lecture by Learnus. As humans, we share the vast majority of our genes, but the comparatively few that vary can have consequences on our height, appearance and potentially even educational achievement. In its first annual lecture Learnus, a think tank that aims to inform education and learning with findings from psychology and neuroscience, invited Michael Thomas, director of the Centre of Educational Neuroscience (Birkbeck and UCL Institute of Education, University of London), to speak about how our knowledge of genetics could potentially impact on education. Professor Thomas pointed out that twin studies have shown educational achievement is highly heritable – countering theories that suggest environment is heavily involved in intelligence or achievement. The effects of which school, or even country, children study in are relatively small compared to the individual differences of genetic origin. In one study with 7 year olds, around 12 per cent of academic achievement in twin studies was be explained by the twins having a shared environment. Only 17 per cent (of that 12 per cent) appeared to arise from the school, while the rest came from the family environment. At GCSE results, looking at twins in the UK, researchers recently found that 62 per cent of the differences could be explained by genetic similarity. Despite this astonishing evidence, the genes involved in educational achievement have been hard to pin down: while some genes seemingly involved in educational attainment are involved in the brain, some are related to functions deep within individual cells, some are even involved in blood oxygenation. 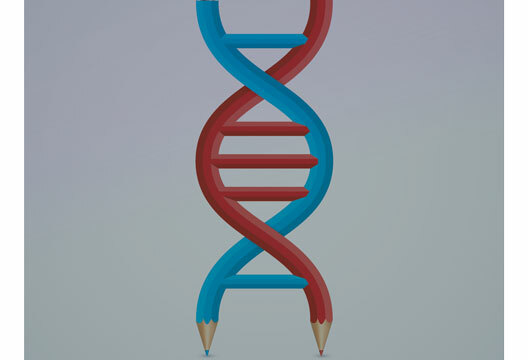 As Thomas pointed out, the role of genes in education is not simple and many different genetic factors may have a role – not only are genes involved in the brain related to achievement but also those to do with health, cognition and physical growth. He went on to examine the evidence around whether socio-economic status had a profound impact on the brain. One US study looked at more than 1000 children and followed them from birth to the age of eight and looked at the surface area of the brain. They did find an impact of deprivation on the brain’s structure, but the effects were small and only really identifiable in families where the household income was below around $25,000 per year: after that threshold the effects on the brain evened out. While findings from genetics are startling, Thomas said, these genetic differences could ultimately inform education. He pointed to precision medicine – the idea of giving people medical care tailored to their genetic predispositions to certain diseases – and suggested that genetics could also be used in education. In the future, Thomas said, genetics could add precision to learning environments for each individual child before they started their education. However, he indicated a myriad of ethical issues attached to this. So far, Dr Meaburn said, there had been five high-powered studies that have looked into which genes may be involved in reading and language abilities. All of these had large samples, but none managed to demonstrate an individual genetic difference that affected the sample’s language or reading abilities. Although we can be sure there will never be a single gene for learning, why didn’t these studies find anything? Meaburn said if we compare these studies to those looking at the heritability of height we might reach an answer. Height is highly heritable, and GWAS have identified specific genetic variants that influence this, and all of them have used much higher sample sizes than those used in studies of learning ability. Meaburn suggested once they are able to have sample sizes in the hundreds of thousands it is likely some specific genetic variants will be identified in learning ability. One study that did have a larger sample size of 126,000 participants, and looked at years of schooling and DNA, found three genetic variants to explain the difference in length of schooling. However even the variation with the biggest effect only accounted for around one month of schooling across the individuals. Meaburn said: ‘This leaves us with a paradox. Even with big sample sizes we find only small effect sizes, but learning abilities are around 60 per cent heritable.’ She explained a new methodology called GREML, which uses statistical techniques, has suggested there will be thousands of genes involved in learning abilities which simply have too small an effect size to be identified by GWAS. Once these genes are identified, academics will be better placed to look at the biological basis of learning abilities and how the environment interacts with these genetic variants. I do not believe that we will ever find a single gene that explains learning abilities. As hinted on above it's the emotional state of the child that's important an over simplification would be either an extrovert or an introvert. I believer all basic emotions are hereditary and this is what we should be concentrating on.